What is the best way to garden? 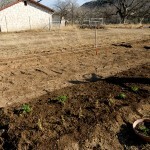 We often hear the question, “What is the best way to garden?” Should I use a square foot garden? Double digging? No-till? Raised beds? Rows? Container? In-ground? Companion planting? Our answer is “yes.” Or more accurately, there is no one “right” way to garden. That statement alone will send up howls of derision and pain from the many devoted followers of one of the above mentioned methods. Before we face the wrath of gardeners everywhere let us explain. We’ve seen and participated in a wide variety of gardening techniques and most were successful. Vegetable gardening is not rocket science. Yes, some people are especially gifted at growing, others not so much, but generally if you place a seed in the soil, give it water, light and warmth, it will most likely sprout and grow. If you plant a garden full of seeds be they in rows, squares, hills, clumps or scattered to the four winds, and give them water, light and warmth they will likely sprout and grow. What your final harvest will be will vary garden-to-garden, season-to-season, gardener-to-gardener, but 9 out 10 gardens will have a harvest. The next question often asked is “So, what is the best garden for me?” The best garden is the one you enjoy spending time in. Each garden site is unique as are your gardening goals. How many people do you want to feed? Are there any vegetarians in the household? How much time do you want to spend in your garden? How much space do you have with 6 hours of sunlight? What is your soil like? Heck, if you live in the Hill County, do you have any soil? Do you like to cook, can and pickle produce? Do you have kids that you want to help in the garden? Do you want to use any off-site inputs like compost, mulch and soil from a nursery, or do you want to make this entirely homegrown? Do you want to sell your produce? Do you hope to win the giant pumpkin contest? And so on. With these questions and answers in mind Bohemian Bounty can create a garden that is right for you. The following are quick explanations of the various gardening methods we call upon when designing, installing and maintaining custom vegetable gardens. No-dig gardening is founded on the belief that disturbing soil by tilling and digging is damaging to the microorganism that create a healthy soil environment. Other effects include exposing millions of weed seeds to the surface to germinate and the loss of nutrients through their interaction with air and water. No-dig gardeners apply compost and mulch to the surface soil and rely on worms and other macro- and microorganisms and weathering to incorporate the materials and nutrients in to the soil. The compost also holds moisture in the soil. Potential downsides: This method does not work well with plants started from small seeds such as carrot, Swiss shard and the like unless very fine mulch is used. Using transplants also defeats the purpose, as digging is required to plant them. No-till requires large amounts of outside inputs unless the gardener has access to large quantities of mulch. Square Foot Gardening is a method popularized by Mel Bartholomew. It promotes the use of an open-box, raised bed of soil comprised of 4 boards creating a 4×4 foot square garden. Practitioners of his method believe it is well suited to small urban yards and areas with poor soil. Those who like an orderly life will enjoy the very regular planting used in square foot where planting is determined by how much space any one plant will occupy. A tomato may take up an entire square foot or more while 16 carrots may fit on the same square foot. The narrow 4 foot beds do allow most people to be able to reach the center of the bed without having to walk in it, which would compact the soil. Companion planting should be emphasized to maintain soil health and decrease insect infestations. 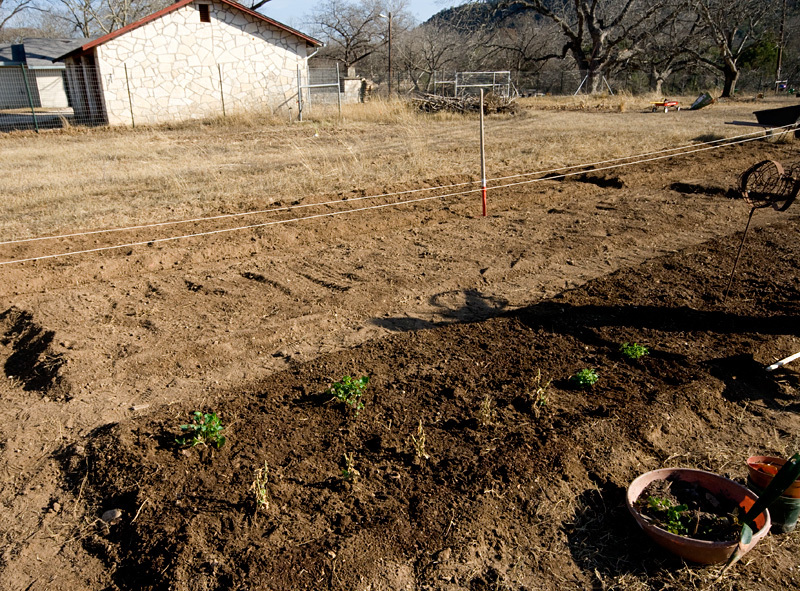 Potential downsides: Square foot gardening requires the addition of external soil, compost and mulch. It is often referred to as Bio-Intensive Gardening. Users also have to bring in wood (or a recycled plastic product), hardware and the latest edition of Bartholomew’s book recommends the use of a ground cloth/weed barrier to entirely separate the bed from the natural soil substrate. Deep rooted plants may not do so well or require a tall raised bed, requiring more inputs. A good soil nutrient and biological complex will require seasonal inputs to remain productive. Raised Bed Gardening is similar to square foot gardening and, in many instances, are interchangeable. However, raised bed gardens do not have to conform to the 4×4 foot mold and may be 2 to 4 feet wide and as many feet long as is desired. Like square foot gardens, the bed is created by using wood, plastic or brick to raised up the planting surface from a few inches to 3 feet. Many raised bed gardeners use the grid method from square foot gardening to lay out their plantings. The height and width of the gardens and paths can be adjusted to accommodate gardeners in wheelchairs. Potential downsides: Same as for square foot gardens although inputs increase as the height and size of the bed increase. Vertical gardening involves the use of trellises, poles, fencing or other practical or decorative means of providing a vertical surface for ones’ gardens plants to grow up instead of out. It can be used with any method of gardening. Trellising provides increased growing areas for plants effectively increasing the size of a garden without increasing its footprint on the ground. Many plants need a vertical growing surface to flourish such as sugar snap peas. Other plants that can grow vertical include beans, cucumbers, peas, gourds, brambles and squash. Vertical growing plants may be less susceptible to fungus and bacteria that thrive on wet foliage, as they should dry quicker than ground plants. Potential downsides: Plants growing up are exposed to the wind and elements more so than those on the ground. They may have higher rates of transpiration, require more watering or be subject to wind burn and damage. Container gardening uses pots and above-ground containers to grow plants. Potential benefits include the complete control of the soil environment, ability to physically move plants to shelter in bad weather and little weeding. They are often employed in areas with no in-ground planting options like condos or apartments. Potential downsides: Not all plants are well suited for container gardens. For very large plants large containers are needed. These will be very heavy and are not easily moved. Container gardening also requires the purchase of all inputs including the container, soil, compost and mulch. This can be expensive. We’ve found through personal experience that keeping the soil healthy seems to be the hardest part. 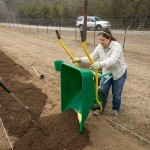 In-ground gardening is often referred to row & furrow gardening. It derives its name for the long raised rows (on which plants grow) and the parallel furrows (which can be used for watering). It is the primary method of large scale farming used in the world. Rows and furrows are created and maintained by specialized equipment pulled by tractors and planting occurs directly in the ground. Crops are usually a mono-culture, with one crop planted over many acres. The majority of the world’s food is grown this way. It does not usually employ the use of natural inputs such as compost and mulch. When translated to the personal home garden row and furrow gardening can be productive but is not particularly efficient. Planting rows oriented north-south will provide maximum exposure to sunlight throughout the day and trench irrigation, while very inefficient, is possible. In-ground planting has the benefit of using the existing soil while minimizing outside inputs. However, narrow rows require an access row beside each one which wastes space and compacts soil. In-ground planting can refer to any garden using the native soil to grow plants. It’s probably the easiest gardening method to practice. If practiced with the addition of compost, mulching and drip irrigation in-ground gardens can be very productive. Companion planting is the careful planning and inter-planting of vegetables, herbs, flowers and other plants to maximize crop productivity, increase diversity, ward off harmful insects, attract helpful insects and improve soil and ecosystem health. One common example are the “three sisters” practiced by Native Americans planting squash, corn and beans together. The corn provides structure for the beans to climb, the beans fix nitrogen in the soil to feed the corn and squash, and the squash vine spreads out its leaves blocking light from weeds below and holding in moisture. Crop rotation involves moving plants within a garden season-to-season, year-to-year to improve soil health, increase production and decrease pest, virus and bacteria occurrence. For example, plants like tomatoes and corn are heavy feeders, meaning they remove a lot of nutrients from the soil. 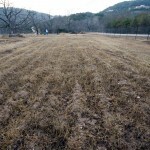 Adding a cover crop of nitrogen fixing plants, such as legumes, will help improve soil health. Other crops, knows as “green manures” are grown not to harvest, but to suppress weeds, decrease soil erosion, improve water infiltration and enhance soil fertility. What Method Does Bohemian Bounty Use? Bohemian Bounty employs a mix of in-ground planting, raised beds and square foot gardening. 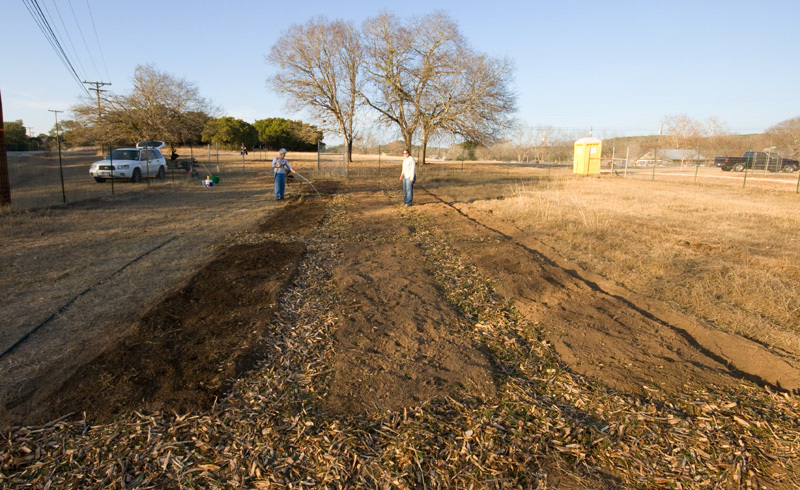 Central Texas has a variety of soils and almost all can be improved with the addition of organic compost. 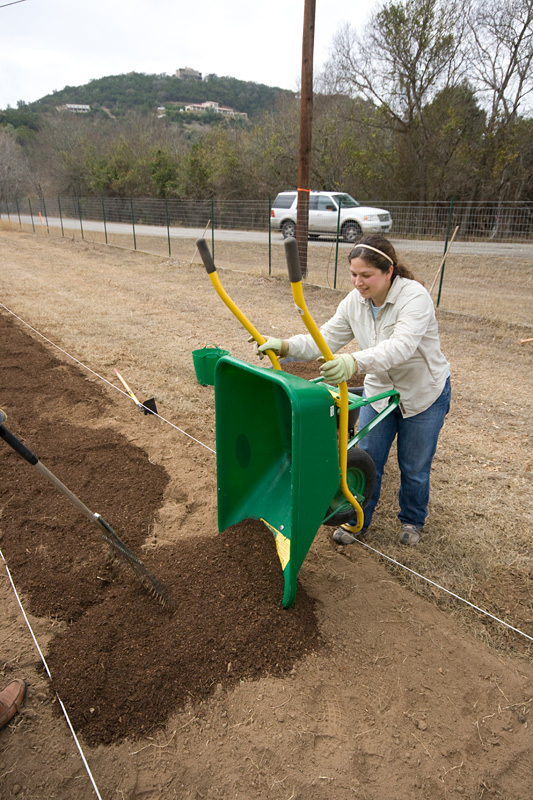 The clay soil types found to the east of I-35 benefit from the used of raised beds, though the beds often do not need to be held in by a structure. 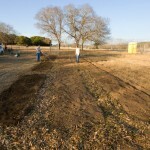 You can simply pull the soil up 6 to 8 inches and leave outsloping sides. However, the use of wood is beneficial if your garden is on a slope or simply for aesthetic reasons. Raising the growing surface aids drainage in these high clay soils. Using the native soil decreases the use of outside inputs, especially compared to true square foot and container gardens, which requires foreign inputs. Initial bed preparation on small gardens can be performed by hand. On larger plots it will usually involved the use of a gas-powered tiller which dramatically cuts down on the time of bed prep. 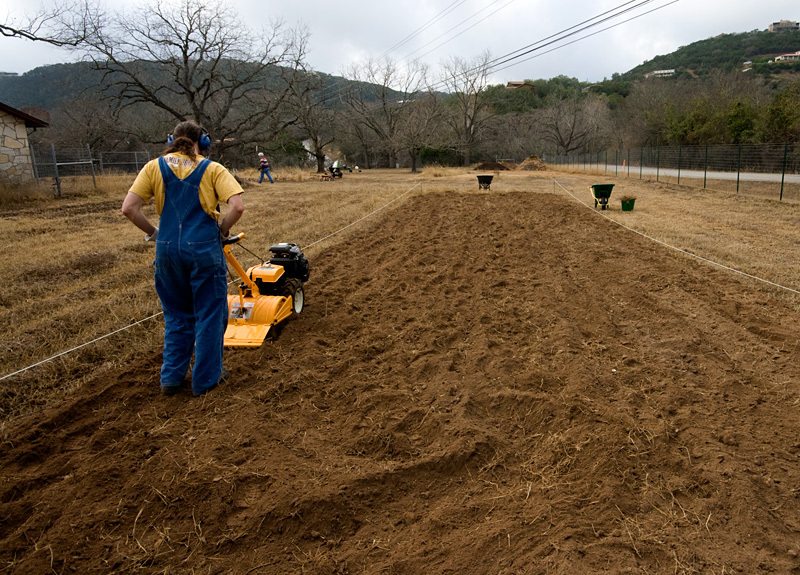 Garden tillers used improperly in wet clay soil can create hardpan. This is where knowing what to look for pays off. If your soil is clumping or sticking to the blade you could be creating a hardpan layer. However, for many gardeners they simply dislike the “non-purity” of using a gas powered machine to create their natural garden place. We completely understand. There is nothing fun about being behind a noisy machine. Yes, you can do the same work with a spade but you better have a lot of time, strength and water because it’s going to be a long day or week. The good news is, after a garden bed is prepped you will most likely never need to touch it with a tiller again. A good soil bed with high organic content can be weeded and even overhauled easily with a spade or other hand-held implements. 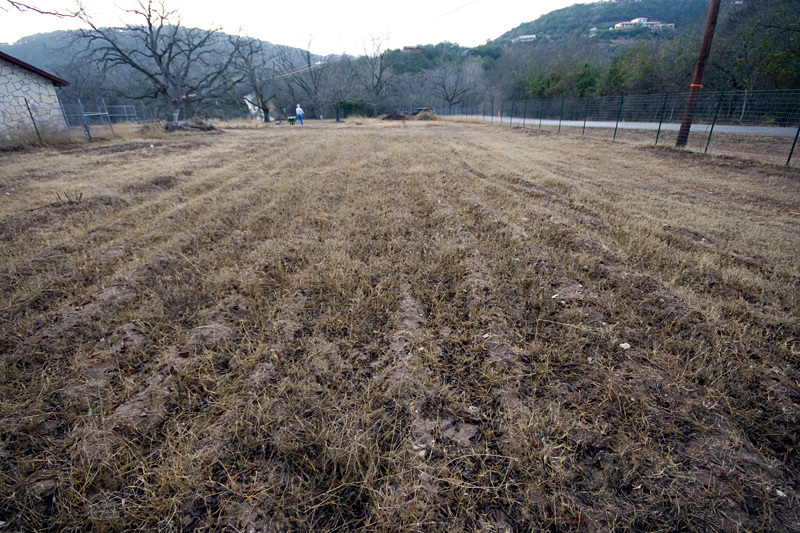 Our latest client’s garden is in a somewhat unlikely location – Wimberly and the rugged Texas Hill County. Known for its abundant limestone rock, Anne picked her location with gardening in mind and the century-plus homestead is along the banks of Pierce Creek near the Blanco River. It has beautiful alluvial soil just right for growing lots of vegetables, fruit trees and berries. When Anne bought the place she knew she some day wanted to have her own personal mini-farm. What she didn’t know was Hurricane Ike was going to punch a great big hole in her house in downtown Houston and hasten her move to Wimberly. While Anne still misses her house in Houston she’s bringing her green thumb and whatever plants she can salvage to central Texas. However, the growing conditions here are very different than the humid Gulf Coast and after going it alone last year Anne knew she wanted some help with her garden planning and bed preparation. While she had some luck last year with tomatoes, basil and watermelon other crops just didn’t take off. In December Bohemian Bounty visited with Anne and toured her amazing garden plot. She’s already had a seven foot fence installed to keep out what is her number one pest – deer. The area covers about an acre and is partially shaded by a massive pecan tree and a small orchard of fig, mulberry, apple and peach trees. With Anne’s desire for a mini-farm in mind Jen designed a plan that incorporates 2 main garden areas composed of multiple narrow 4-foot wide linear beds, accessible by 2-foot wide foot paths throughout. In total, when fully planted out this personal farm encompass 1,440 square feet of bedding space! And that’s not including the 10-foot x 6-foot raised box built to hold Anne’s raspberry brambles. Yes, Anne is determined to grow raspberries which she grew up enjoying in Ohio. Jen included a 3 year suggestion for plant rotation emphasizing companion planting and cover crops to capture some nitrogen which is low in the soil. Anne was thrilled with the plan and took Jen’s advice to start with only one large bed and the raspberry box. Anne wanted to be hands-on and do all the planting and we are all for everyone getting dirty so in one day we prepared the first of four bedding areas. 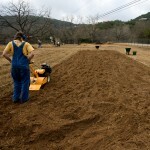 The bed prep work included measuring, flagging, tilling, rock and weed removal, incorporation of compost and cottonseed meal, mulching and the building of raised cedar box. Anne was planting vegetable seeds, transplants from Houston and her raspberry brambles by the end of the day! The garden area had been disked in 2008 but was now overrun with bemuda grass. Under the bermuda is beautiful soil. Jen adding compost. Lots and lots of compost. Anne’s already planting the first bed before the next two are finished. She is motivated! End of the day, beginning of Anne’s personal farm. Bohemian Bounty was happy to help! We recently viewed the movie, The Real Dirt on Farmer John. All we knew before watching it was it was supposed to be the inspirational, true-life story of a successful, independent farmer. 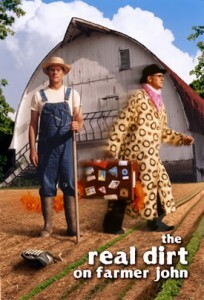 Excellent – a movie about the farm that doesn’t involve a talking pig! However, the beginning of the movie made us wonder if we had been duped – what did this man wearing a pink boa riding a tractor, talking about being “different” have to teach us? We seriously pondered grabbing the remote and watching a talking pig movie instead. Fortunately, we didn’t. By the second half of the movie our connection to Farmer John began to flourish. Personally, coming from a family who filmed my life in 8mm and super 8mm, I appreciated the use of John’s family film footage. The downfalls and realizations that brought the story full circle – from the farm chores of a child to the successes as a young farmer to the loss of the family farm to foreclosure auctions and, finally, to a successful CSA farm birth – was the most magical part of the story. We are grateful for Farmer John’s mother’s foresight and his own for documenting the whole story and sharing it. It takes courage to show the world your eccentricities and failures.